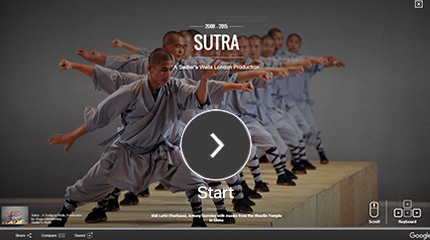 One of Sadler's Wells' most exhilarating productions, Sutra has toured around the world and played to sell-out audiences as far afield as Singapore, New Zealand, Mexico and the US. Seen by over 160,000 people worldwide in 60 cities across 28 countries, this critically acclaimed collaboration between choreographer Sidi Larbi Cherkaoui, Turner Prize-winning sculptor Antony Gormley and 19 Buddhist monks from the Shaolin Temple in China is an incredible spectacle of athleticism, exploring the philosophy and faith behind the Shaolin tradition and its relationship with Kung Fu within a contemporary context. 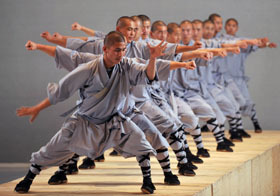 With Antony Gormley's striking set of 21 wooden boxes and Polish composer Szymon Brzóska's specially comissioned score performed live, Sutra is an incomparable work that has captured the hearts and imaginations of people the world over, as one of the stage's most sophisticated productions and a true work of art. ★★★★★ "This unique, proundly imagined show takes the concept of cultural exchange to a whole new level"